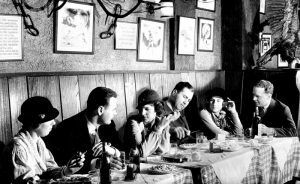 Speakeasies, illegal taverns that sell alcoholic beverages, came to an all-time high during the Prohibition era in the United States from 1920 to 1933. These bars, which were also called blind pigs or blind tigers, were often operated by organized crime members. 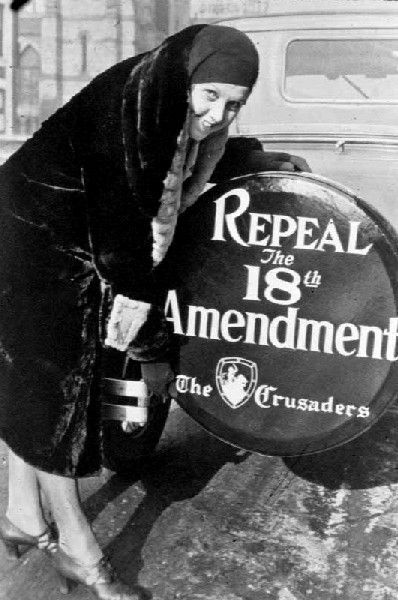 In 1917, the 18th Amendment to the United States Constitution, which prohibited the “manufacture, sale, or transportation of intoxicating liquors” was drafted and passed national legislation the following year. Called the “noble experiment” by Herbert Hoover, 75% percent of the states approved the amendment, and it was ratified on January 16, 1919. In 1920, the Volstead Act was passed to enforce the amendment. Initially, Prohibition advocates rejoiced in their initial their “successes,” as arrests for drunkenness declined and medical statistics showed a marked decrease in treatments for alcohol-related illnesses. However, statistics also demonstrated that drinking, in general, had been decreasing for several years before Prohibition, and many felt that any further decrease was due to the high cost of bootlegged liquor, rather than the law itself. With World War I at an end and the nation in high spirits, the demand for liquor quickly increased and another culture emerged for those who saw opportunity and financial gain in thwarting the new law and filling the public demand. 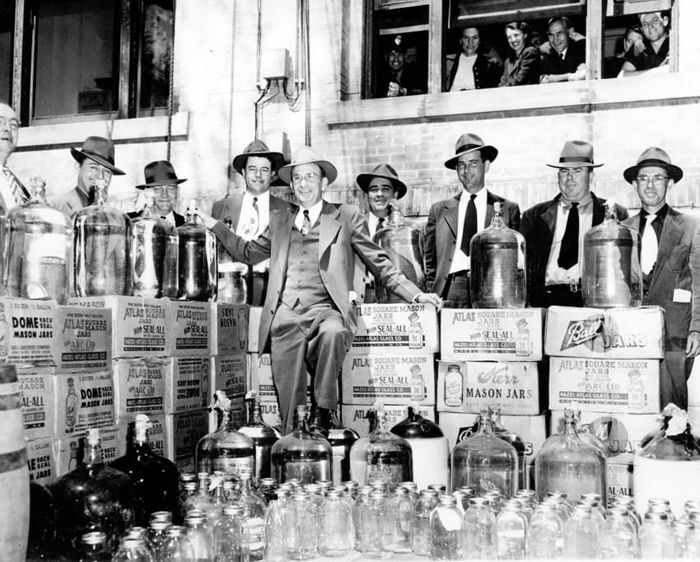 Bootleggers, illegal alcohol traffickers, and speakeasies began to multiply by the hundreds. 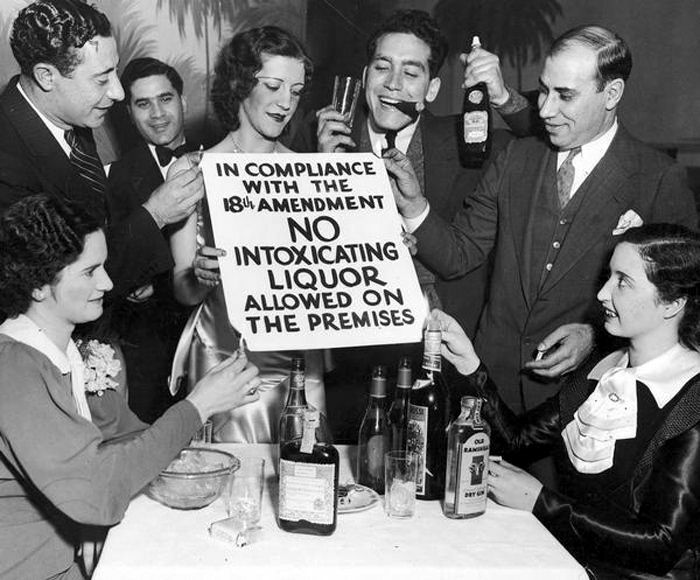 At one time, there were thought to be over 100,000 speakeasies in New York City alone, New Jersey claimed there were 10 times as many as before the amendment, and Rochester, New York, twice the number. The same became true all over the nation. Gone were the boardwalks, swinging doors, spittoons, and mustache towels of the saloon era, as speakeasies disguised themselves in numerous creative ways. Generally, before a thirsty patron could cross the illegal threshold, a password, specific handshake or secret knock was required. Gone also were the tinkling sounds of the player piano and dance hall girls, as Prohibition ushered in the age of Jazz. With stiff competition from numerous establishments, many of the speakeasies provided music for their patrons and hundreds of jazz musicians easily found work. And, where there is dancing, there will be women. But in these new “saloons” of the Prohibition era, these many women were not exclusively dancehall girls or entertainers. Having been long banned from the saloons of the past, “regular” women found easy entrance into these new establishments. No longer did the free flowing liquor in speakeasies carry its former names of White Lightning, Tanglefoot, and Firewater; alcohol now carried the new monikers of cocktail, devil’s candy, bathtub gin, booze, and hooch. Where beer and wine had previously been the drinks of choice, now alcohol was drank much more frequently, as it was easier to transport and took up less space, making it cheaper for speakeasy patrons. 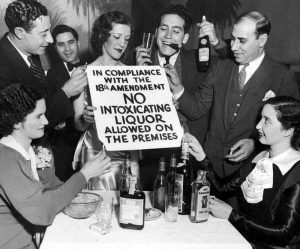 It was at this time that the “cocktail” was born, which had virtually been non-existent prior to Prohibition. In the days of the “Old West,” most men drank either beer or straight shots of liquor. However, during this new era that welcomed women, alcohol began to be mixed with soft drinks, sugar-water and fruit juices. 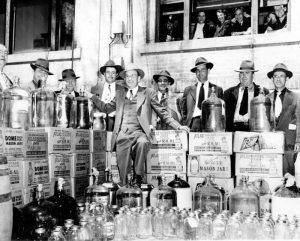 Making the bootlegged liquor much more palatable, millions of people who didn’t like the taste of beer, wine, or hard liquors found cocktails irresistible, turning men and women alike, into “criminals” by the thousands. While often having their cocktails in teacups in case of a raid, old social barriers were broken, as the rich and powerful began to rub shoulders with ordinary folks. From housewives, to large business owners, blue collar workers, corrupted police chiefs and mayors, these many patrons befriended each other in their quest of the same goals – drinking and avoiding the law. In the speakeasies, the phenomenon of drinking to get drunk became a popular past time, where before alcohol was generally considered secondary to eating and socializing. Increasingly, it began to be fashionable to flout the Prohibition laws and the hip flask became a symbol of rebellion, seen everywhere – at theatres, festivals, and sporting events. Like their counterpart saloons of the past, prostitution and gambling flourished in speakeasies. But, they also introduced a new element to their patrons – drugs. Many, who would never have come into contact with these substances, found a new source of “entertainment” in the permissive atmosphere of the speakeasies. Narcotics, hashish, and marijuana were soon used in abundance. To supply these many illegal establishments with beer, wine, and liquor, organization was required, hence the birth of organized crime. 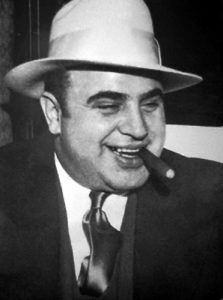 Into this crime-ripe environment walked such characters as Al “Scarface” Capone in Chicago, the Purple Gang of Detroit, Lucky Luciano in New York, and hundreds of others. The largest majority of speakeasies were established and controlled by organized crime, who opened everything from plush nightclubs to dark and smoky basement taverns. Though raids became a daily federal past time, law enforcement couldn’t keep up. When the enforcers were successful in targeting a “gin joint,” the anticipating club owners, were often able to disguise the true intent of their businesses as elaborate alarms were installed, and their illegal contraband hidden in drop-shelves and secret cabinets. Other establishments didn’t even bother with hiding or disguising the liquor, as they paid out part of their profits to Prohibition agents and police officers, leading to a monumental amount of political corruption. 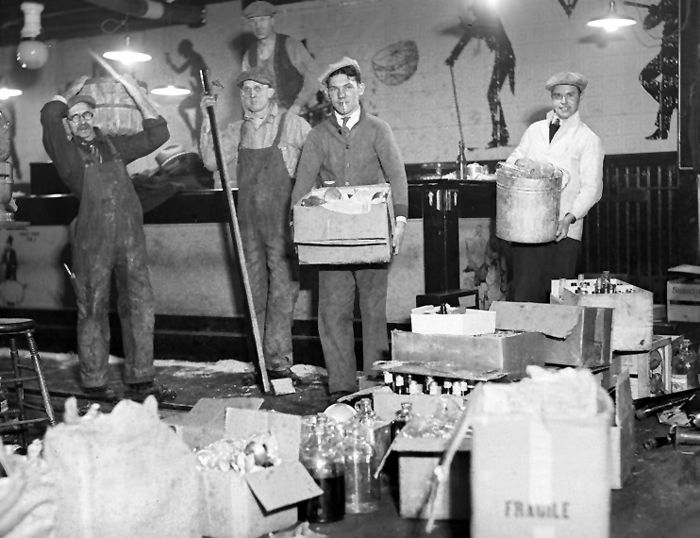 Dismantling a Speakeasy in Boston after a raid. Increasingly, organized crime groups controlled the liquor industry, which led to turf wars and gang murders, the worst of which was the St. Valentine’s Day Massacre of 1929 in Chicago. 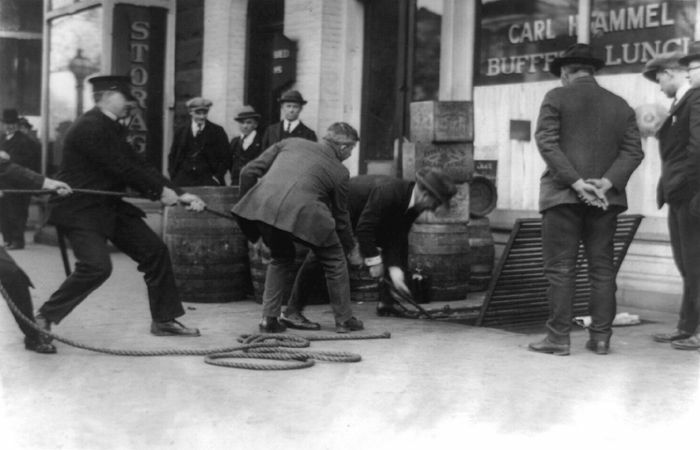 Blamed on Al Capone, seven men were killed in the increasingly violent war over liquor control. Though gaining the most attention, this was just one violent event of the era, as by the late 1920s, Chicago authorities reported as many as 400 gangland murders each year. Chicago was not alone in its high crime rate, as virtually every city across the nation was rife with illegal liquor trafficking, speakeasies, and the violence that they bred. Another setback for prohibitionists was their loss of control over the location of drinking establishments. Where before, ordinances and licensing laws were utilized to limit alcohol sales on Sundays, election days, and in certain neighborhoods, illegal speakeasies sprouted up everywhere without limitation on their hours. Serious crime rates, which had been falling during the first part of the century gradually reversed itself during Prohibition, as homicides, burglary, and assault increased, and the prisons began to become overcrowded due to those incarcerated for alcohol-related crimes. In no time, American prisons were suffering from extreme overcrowding. As the newspaper headlines across the country screamed violent headlines, the public increasingly blamed Prohibition for the violence, as well as the political corruption that had become rampant across the country. Before long, groups began to organize to repeal Prohibition, especially after the Great Depression, when people were looking for jobs, ones that would be created if breweries, distilleries, and taverns could reopen. Even Herbert Hoover was forced to admit that the 18th Amendment was offering more harm than good. By 1932, both presidential candidates, Franklin D. Roosevelt and Herbert Hoover, favored repeal. When elected, Roosevelt backed the repeal and on December 5, 1933, the 21st Amendment to the Constitution officially repealed the 18th Amendment and the “Noble Experiment” came to an end. Whether it’s called a saloon, a speakeasy, a bar, or a tavern, these many recession-proof businesses will no doubt, live, not only in our rich history but long into the future. 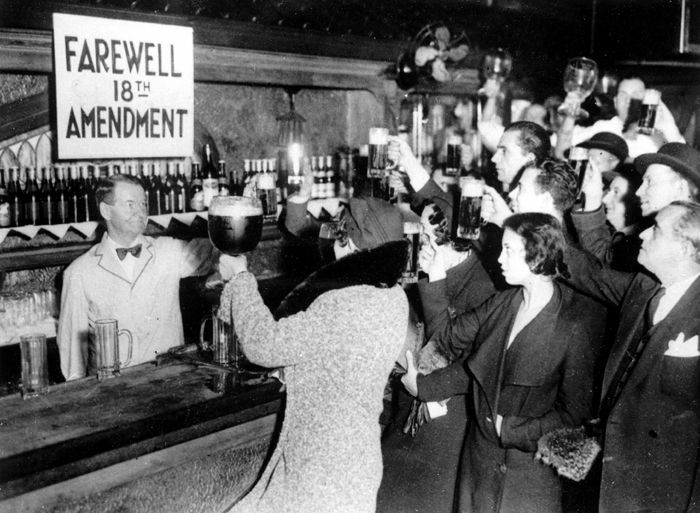 Customers at a bar celebrate the end of Prohibition, 1933. © Kathy Weiser/Legends of America, updated March 2019. When I sell liquor, it’s bootlegging. on Lakeshore Drive, it’s hospitality.